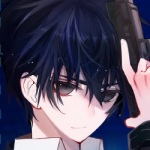 I’m a high school boy and a bestselling light novel author, strangled by my classmate who is my underclassman and a voice actress. This is my current predicament. She, dressed in a ¾ sleeve shirt, reached her hands out for my neck. The slender fingers on her hands were wrapping around my carotid pulse, clamping them from the sides. I feel that I have a muffler made of chains wrapped around my neck. In my vision, I can see her head. The large eyes are dichromatic. The right eye’s a faint grey, and the left’s brown. And her cold hands really feel comfortable. It’s probably because this room’s a little too hot, so hot that I’m spacing out, which is why it feels very comfortable. I start to recollect the events that transpired. Currently, it’s lined in the Pocket Book (Bunko) section of the bookstore. My work is classified as a ‘light novel’, released by a publisher called Dengeki Bunko. I debuted two years ago, in August, back when I was in my first year of high school. Currently, the series is published till the 9th volume. After taking a year away from school, I started going to school again, and I’m in my second year of high school. The After Record of the anime, in other words, the recording of the voice actors’ work began at the beginning of April. To attend the recording session every Friday morning at 10 A.M., I would take the Limited Express to Tokyo every Thursday evening.. I was seated at the last row of the free seating carriage, to the left. Eri Nitadori, the girl with long black hair and faint blue glasses, was seated at my right. My classmate, seated right behind me in the classroom, a year younger than me, who took leave from school for a year. It was less than 10 minutes since the train left the station. I guess she deliberately added some perfume since her wig’s giving off a fragrance–maybe that’s what I’ll call it. That black hair’s very close to me. Her closed eyes are so close to me, it seems like they’re able to feel my breathing. I can clearly see her long eyelashes, white skin and red lips. Can I hang on for another 2 hours with such repressed feelings? No, I can’t. And furthermore, if that causes Nitadori’s wig to fall, I’ll be more flustered before, so much that I want to jump out from the train. Right when I’m panicking inside and not moving at all. I hear a soft voice diagonally above me. The hushed voice barely made it through the noise of the train. I turned my eyes towards the aisle, and found that it was Miss Kamishiro. Whenever Nitadori heads to the capital, she’ll come along, so I get the feeling that the latter is Nitadori’s bodyguard. Before I know it, Miss Kamishiro got up from the seat on the right end of the row I told her to sit at when she got onto the train. To avoid shaking Nitadori’s head, I receive it with my left hand. With my hand, I receive an earphone, and a black object that’s as thick and large as a 100 Yen coin, connected to a cord that’s about 30cm long–what are these? Miss Kamishiro said it so nonchalantly, but I never thought this person would call me ‘sensei’ too. Miss Kamishiro continues to explain with a flat, calm tone, and sits down in front of me, before turning behind to hand the cable, which I received. Even this dull-witted me can tell what Miss Kamishiro wants to do. She wants to talk to me while keeping it a secret from Nitadori. Does she always carry this thing along? Or is it that she only does so today? I don’t know. I can hear some little noise with Miss Kamishiro’s voice. The voice’s vague as compared to hearing it directly, but I can still hear her words well enough. Miss Kamishiro answered. It seems that she’s able to hear me. This little thing is called a ‘throat microphone’, able to sense the vibrations of the throat, and can be used even in noisy situations. I know the existence and name of it, but it’s the first time I’m using the real thing. It’s a good experience, and next time, I want the device to show up in ‘Side Sin’. In Reputation, the outstanding magicians are able to cast spells faster than the others, and able to sense magic from further away. With such a device, there won’t be any presence left behind, and can be used to trick them. My delusions progress to such a point at that moment, and I intend to record the idea into my smartphone. But Miss Kamishiro won’t allow me the time to do so. Hearing the poised voice by Miss Kamishiro, I hastily answer. I’m tense, but I end up saying what I want to ask. And so, Miss Kamishiro told me a lot of things, while I merely answered from time to time as I listened. I really want to use this name for a character in a certain story, but now’s not the time, so I pass on seeking her approval. Only at this moment does she answer with a kind voice. Only at this moment. 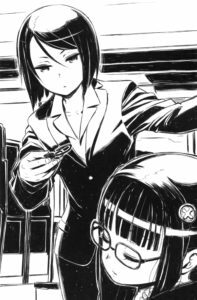 And as I expected, Miss Kamishiro’s the personal bodyguard to Eri Nitadori. She has been accompanying Nitadori ever since the latter lived overseas, and it has been over 5 years. To avoid abduction overseas, it’s necessary to have a bodyguard and a chauffeur. Thus, she has been fetching and sending Nitadori off in place of the latter’s parents. Miss ‘Kamishiro’ takes the ‘place’ of the parents, and I found it cool. It’s said that she didn’t need to do that much in Japan, given the good security. However, whenever Nitadori had to spend her nights outside, she would accompany, or in other words, ‘watch over’. Thus, as I had expected, she would accompany Nitadori to Tokyo, participating in the After Record. That was also the case when I first met and spoke with Nitadori on the train, April 10th. The train continues to move forward, stopping at many stations. I turn to my right, looking at her sleeping face. Nitadori’s really sleeping nicely. And Miss Kamishiro continues to explain with a poised voice, as though reporting the events happening on this world. But I feel Miss Kamishiro’s probably unable to understand these words. Miss Kamishiro pauses for a while. That was because I could never forget, and I’ll never be able to forget. My secrets aren’t divulged, so she’s likely to blackmail me, but she chooses to spare me. I ask this just in case. If not, she wouldn’t be mentioning about ‘me remembering the name’. 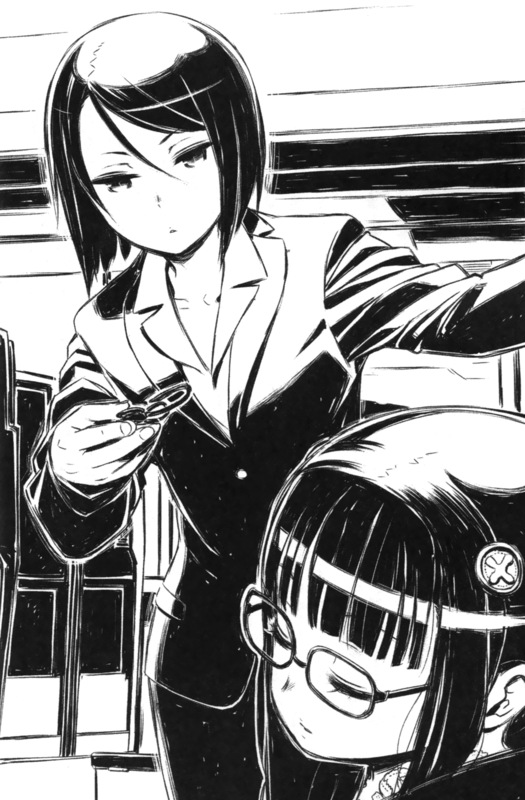 This alone allows me to understand how much Nitadori trusts Miss Kamishiro. In other words, Nitadori’s about to honestly say how she once thought about killing herself, and unable to talk to her parents about this. In any case, if I did anything wrong, Nitadori wouldn’t be taking this train, and I probably will never have the chance to talk to her again. I heave a sigh of relief, really earnestly. She choose not to talk about that, and I decide to say what’s on my mind. If not now, then when? I have to thank her. Ahh, I’m glad to be praised. She asks, but I really don’t have that kind of experience. I express my true thoughts, only to hear Miss Kamishiro lashing at my left ear with an unprecedented harsh voice. No matter how dull-witted I am, I can tell that it’s a furious tone. The normally terrifyingly collected Miss Kamishiro is just terrifying to me now. Unable to say anything, I don’t know what she’s angry about, and I don’t know what’s she’s going to say next. Now that she mentioned it, it is true. Miss Kamishiro presses the switch of the microphone, but doesn’t say anything. This is the first time it happens. For the second time, she remains silent. I, seated behind Miss Kamishiro, is unable to see any expression on her face. I guess she’s having a headache over it. No, she definitely is. I didn’t die, Nitadori didn’t become a killer, and the plot progression of ‘Vice Versa’ is more optimistic. After a long pause, Miss Kamishiro speaks up. She sounds calm, but I feel a chill down my spine. It’s about what’ll happen after I die, but I don’t wish for that to happen either. For the third time, she’s silent. Miss Kamishiro looks as though she wants to say something, but doesn’t. I can sense her speechless expression through my ears, and sense the atmosphere through the seat in front of me. For the usually poised Miss Kamishiro, those words sounded really timid. If I’m to boast, I’ll probably say that she’s human after all. Bodyguarding is a really tough job. One has to be often wary of the surroundings. Luckily, I’m a high school boy and a light novel author. Thinking about this, I suddenly heard a puzzling question. I don’t think Miss Kamishiro is joking, so I suppose it’s a serious question. However, I really don’t know what she means. Intend to do what? Refer to ‘waking her up because I feel uncomfortable being a pillow’? Doesn’t seem to be the case. Intend to do what? Refer to ‘I got strangled, so I want her to lose her job as a voice actress’? Doesn’t seem to be the case. Or I should say, definitely not. Do what? I want to know the meaning to this question. Thus, I decided to do that. For the fourth time, Miss Kamishiro remained silent, and so I frantically add on. When talking to Miss Kamishiro, I forget that there’s a girl still leaning on my right shoulder. It’s not heavy at all, but it does give a strange sense of presence. I want to try adding this when writing the thoughts of a protagonist. If I’m to use her as the basis, I’ll have to get approval from her, I guess? I have become Nitadori’s pillow, so I can’t move, and can’t reach for the luggage on the rack. I got got nothing to do. Thus, I start to stare at the window. Less than a minute, and it seems the fatigue from the person sleeping beside me has spread to me. I’m starting to feel tired. No matter what, I have to stay awake. Luckily, the weather’s fine. Let’s look outside the window, and think about the future plot progressions for ‘Vice Versa’. I can’t use my laptop, but luckily, I have a smartphone in my pocket. Let’s use this to record the idea. Still remember having such thoughts back then. And when I woke out, I found that the train was about to enter the terminal, where the bright lights shone. What with all this comments from translator???? Is it some meme translation????? ?